Hospital systems face tremendous pressure: changing government regulations, tightening of reimbursements, and an increasingly tight labor market. Nearly 18 percent of new RNs resign from their first nursing job during the first year—and a third leave within two years. According to the 2018 National Health Care Retention & RN Staffing Report, the average cost of turnover for a bedside RN is $49,500 and ranges from $38,000 to $61,100. This results in the average hospital losing $5.7M. New data from the federal government shows a projected deficit of more than 20,000 physicians by 2025 (taking into account graduate medical residents), according to the U.S. Government Accountability Office. 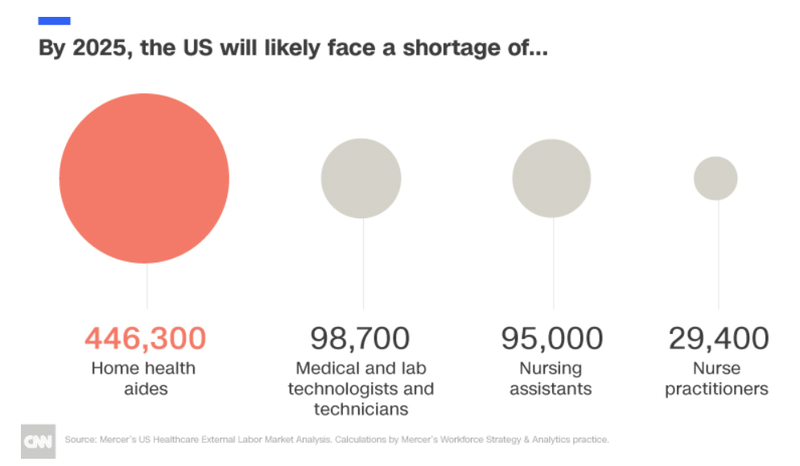 The U.S. will need to hire 2.3 million new health care workers by 2025 to adequately take care of our aging population, a new report finds. 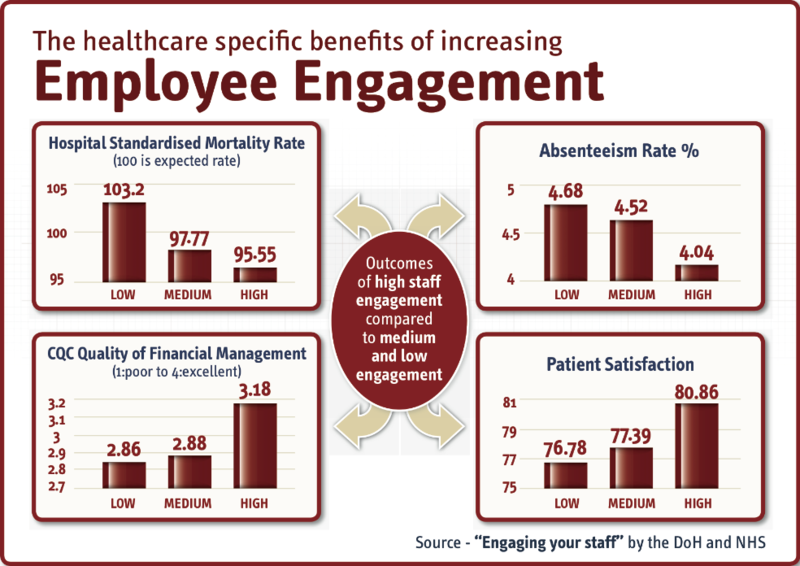 Providing quality healthcare to patients depends on engaged employees. It is more important now than ever to understand why staff members leave, and how you can attract and retain talented nurses, physicians and other staff. Interacting with patients can be stressful and as insurance reimbursement assumes greater importance on the business side, health care workers are being asked to perform tasks more efficiently and with fewer resources. Consistent and sustained recognition or high-quality work is an important but often overlooked way to maintain high levels of workforce satisfaction. While the current labor situation in the healthcare industry is certainly driven by the inherently stressful responsibilities of the employees and the aging of baby boomers, the high turnover rate is also caused by a reason that can be controlled – employee recognition and satisfaction. When asking employees why they quit their jobs, 82 percent of those polled report that they don’t receive enough recognition (from Workplace Deal Breakers BambooHR 2014). According to the Cicero Group, 78 percent of employees are highly engaged when they experience strong recognition, and 65 percent of employees would work harder if they were recognized by their employers, according to The Center for Generational Kinetics, 2016. Underappreciated and overworked employees will never be able to perform to their best. A successful rewards and recognition program decreases turnover, improves outcomes and promotes the core values of hospitals. Staff members are more engaged, work harder, and are likelier to stay when they receive strong recognition, they also provide better patient care. Highly engaged staff can reduce mortality by 7 percent and increase patient satisfaction by 5 percent (see infographic below). Employee engagement strategies move the needle for employee satisfaction and retention. Healthcare managers should use these programs and combine them with the proper tools, education and empowerment methods to ensure that their employees are engaged with their work. Execution is paramount for new initiatives to take hold. Recognition programs in the healthcare industry should be balanced between value- and performance-based initiatives. Provide a variety of daily recognition ideas, both non-monetary and monetary, formal and informal. A personal touch goes a long way toward showing employees they are appreciated. Ensure buy-in through manager education and awareness. Make it easy for managers to run reports, receive notifications, and recognize staff within their workflow. Adopt appropriate program technology. A unified and flexible recognition program offers administrators and employees access from any device, making it easy to recognize and be recognized. Review the program periodically and formally to customize goals, initiatives, and rewards. Hospital systems nationwide have found ways to use recognition programs to not only boost employee productivity and engagement while improving patient satisfaction, but also for improving employee health and increasing brand awareness and consistency across their organizations. Covenant Health System, a large healthcare system in West Texas and Eastern New Mexico, found great value in its recognition program and its tie to overall employee engagement. The goals of the program included lowering employee turnover, increasing satisfaction and improving their public image. Program details included a multifaceted recognition program, rewarding specific employee behaviors, and giving employees opportunities to earn recognition points for preventative health care initiatives. The healthcare organization also used their recognition program to rebrand and unify Covenant’s workforce after a merger. Using a centralized recognition platform connected employees working in different locations across the same network. Employee recognition programs can play a central role in increasing employee engagement and satisfaction. Trinity Health System in Steubenville, Ohio has developed a highly successful employee recognition program, focused on five best practices. Each month, the Employee Reward and Recognition Team meets with managers to discuss what is going well in their areas of the organization. Trinity Health System gives a motivational assessment to every new hire to identify how each employee likes to receive recognition. The outcomes influence how the organization designs their recognition programs. Two central components of Trinity Health System’s employee recognition program are the Employee of the Month and Employee of the Year awards. The Employee Reward and Recognition Team has also developed several other ways to reward staff in non-monetary ways, such as personal thank you notes. Each month, managers recognize outstanding performance and send thank you notes to staff. This information is recorded in the performance management system and is incorporated into employee evaluations. A large hospital system needed an innovative way to differentiate its brand in the crowded Northeastern U.S. healthcare marketplace. The hospital network found it difficult to draw attention to its unique programs and services in such a highly competitive environment, and was interested in exploring unique ways to tell its story to the broader community. At the same time, they wanted to boost employee engagement and reduce staff turnover. Taylor Healthcare developed an “employees as marketers” campaign designed to make the hospital’s employees feel more closely aligned with the organization’s values and achievements. Through an online rewards portal, employees were able to earn points for sharing social media content and watching educational videos, transforming these individuals into informed, passionate and uniquely compelling ambassadors. Employees can redeem rewards points for branded items, giving the network heightened visibility through apparel and promotional items. The campaign has been an unqualified success. Nearly 60 percent of all hospital employees — more than double the campaign’s goal — have logged into the rewards portal and watched at least one video. In addition, employees have redeemed nearly 3,000 branded items, resulting in countless brand impressions in the wider community. Adopting a formal reward and recognition program, while requiring a small time and financial commitment, can pay major dividends in terms of greater staff engagement, employee satisfaction and better patient experiences. For information on how Taylor Healthcare can enable your program’s success, visit www.taylorhealthcare.com.